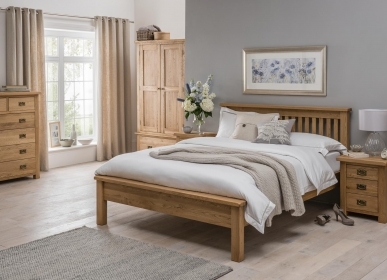 A stylish and useful purchase for any bedroom, invest in a blanket box from the Rustic range and add that elegant touch to your bedroom suite. You will not be disappointed with its design of gently rounded corners and straight lines, nor with the lacquered rustic finish. Handmade from durable American White Oak, the blanket box is a sturdy and stylish piece of furniture.